Aggies Do It Better: Golden globes Nails 2014! Can I just say, it's so weird to type 2014! Here are some quick nails I did for this weekend's award show the Golden Globes. I love award shows, but more I love the red carpet specials to see what everyone's wearing! yay. I've had these Picure Polishes for weeks and only now had time to use them! How gorgeous is Monroe?? I experimented a little with glitter placement with this crazy awesome holographic NOPI I grabbed as soon as I knew it existed! It's one of the few polishes I have that I paid full price for. 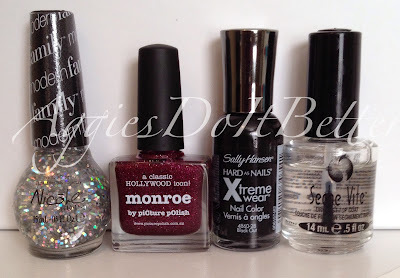 Here's the lineup: Nicole by OPI Spark the Conversation, Picture Polish Monroe, Sally Hanson black, Seche vite.